It’s been a rough couple of years for the Fantastic Four. Both in the real world and in the Marvel Universe. The on-going battle between Marvel Studios and Fox over the film rights to the franchise saw Marvel Comics stop publishing a monthly Fantastic Four comic in a bid to deny any sort of cross-promotion to the 2015 Fantastic Four movie. Given how infamously awful that film turned out to be, they needn’t have bothered, but that’s another story. 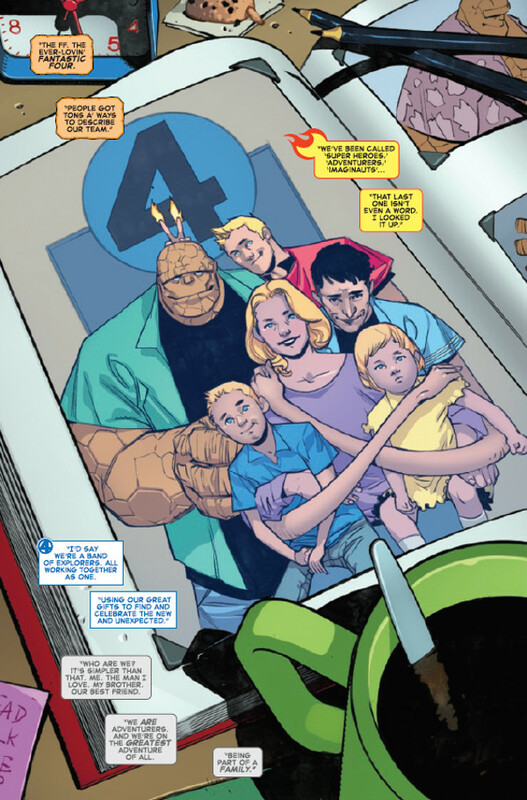 Regardless, the past few years have seen Reed and Susan Richards lost in space, Ben Grimm joining the Guardians of the Galaxy and Johnny Storm living with The Inhumans. They also saw Doctor Doom reinventing himself as a new Iron Man during the time when Tony Stark was presumed dead. Thankfully, with Fox recently sold to Disney, the time has come for Marvel Comics’ First Family and their greatest enemy to return! It spoils little to say that we don’t actually get to see the glorious return of the Fantastic Four promised by the cover in this issue. The first steps are taken, however, to see The Invisible Woman and Mr. Fantastic reunited with The Human Torch and The Thing. That’s not really what this issue is about, however. What this comic is about is reminding us of who these characters are and what made The Fantastic Four so revolutionary. While Stan Lee and Jack Kirby would go on to refine the formula more strongly with later creations, Fantastic Four was the first superhero book to challenge the usual character cliches of the genre and develop its main characters into more distinct personalities. Reed Richards, for instance, looked like the usual stock scientist character common to Atomic Age science-fiction but was also a pompous jerk. The hot-tempered and impatient Johnny Storm seemed like a more realistic teenager than the clean-cut, golly-gee Robin and Bucky. The Thing was a noble monster – Frankenstein’s creation in orange rock. And Invisible Woman… well, eventually she became a more proactive heroine. (Sorry, Stan! Gotta be honest!) 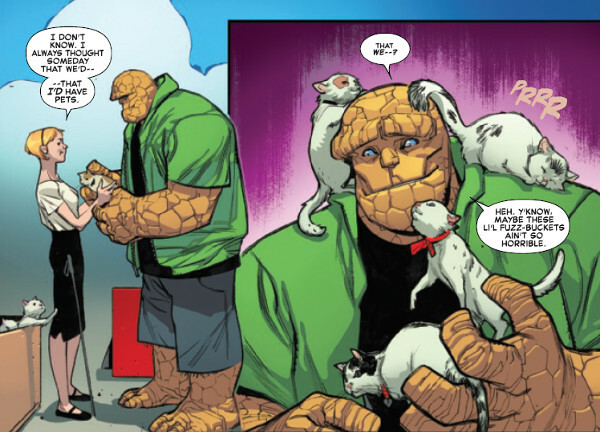 Dan Slott’s love for these characters is apparent and he does a fantastic job of handling both The Thing and The Human Torch, who are the focus of most of the first story. The artwork by Sara Pichelli, with colors by Marte Gracia, is vibrant and animated. The story and the artwork feed each other perfectly, balanced yet piercing, like a finely made sword. Where this issue truly excels, however, is in its back-up story. It is here that Slott and artist Simone Bianchi begin to restore Victor Von Doom to his proper place as the greatest hero in the Marvel Universe. Hero? Yes, you read that right, True Believers! Because nowhere did Lee and Kirby more masterly subvert the order of superhero comics than with their creation of Doctor Doom – a villain who was, in many ways, more heroic than the “heroes” he routinely fought against. The story here is a prime example of this, focusing on a Latverian peasant who dares to enter into the long-vacated Castle Doomstadt, after spying a light inside of it. It is here that she finds Doom, wounded in body and spirit, lamenting as only the truly great can after a fall from grace. Yet Doom puts his cares aside, after the woman informs him that the forces that have taken over Latveria in his absence now threaten to destroy his people with Doom’s own technology. Slott writes Doom in a Shakespearean fashion, with all the gravitas that the character demands. Bianchi’s artwork proves a perfect match for this dialogue, possessing a similar dark complexity. Even those who dismiss Doom as a mere villain will find it hard to reconcile that portrait, forged by lesser writers, when they consider his actions here. 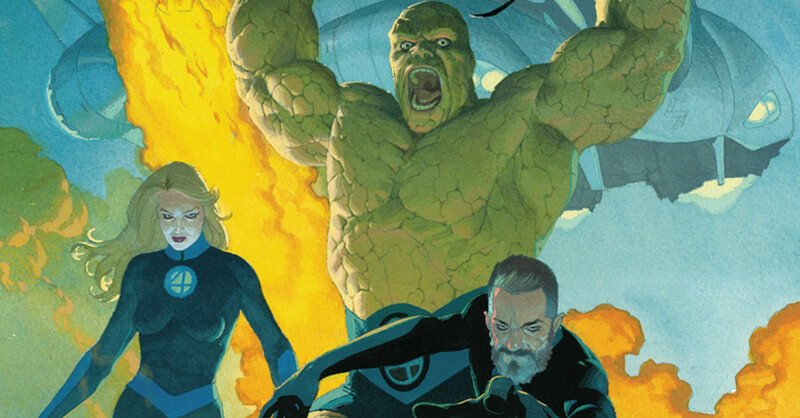 Fantastic Four #1 may not bring about the return of Marvel Comics’ first superhero team. It does, however, take a solid step in that direction. It’s also a darn good read and well worth picking up. 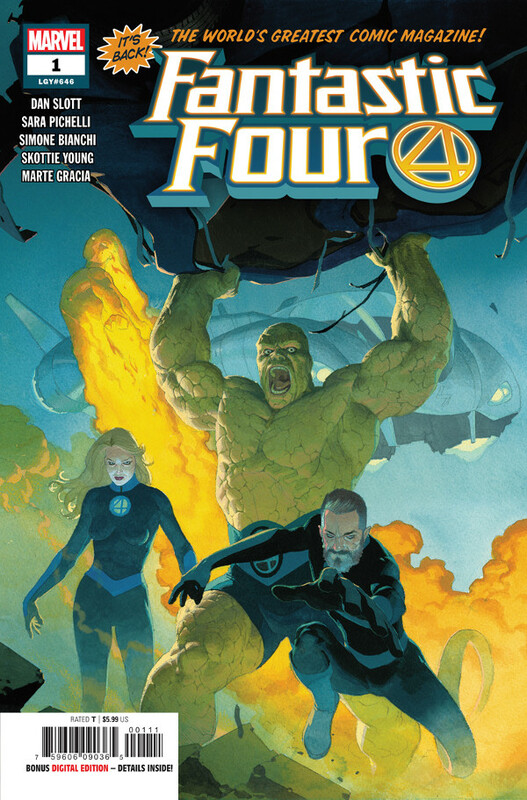 9/10 Fantastic Four #1 releases on August 8, 2018!